This June, you can support Center for Independent Futures at your favorite neighborhood pizza place, Gigio’s Pizzeria! For every extra-large pizza ordered during the month, Gigio’s will donate two dollars to Center for Independent Futures. This year will be the third that Gigo’s is supporting our community. Last year, their efforts raised over $500 for hopes and dreams. To order your extra-large pizza during the month of June to support Center for Independent Futures, call Gigio’s at (847) 328-0990 or visit them at 1001 Davis Street in downtown Evanston, just down the block from our office. Gigio’s Pizzeria has been serving the community since 1968, making it the oldest pizza place in Evanston. 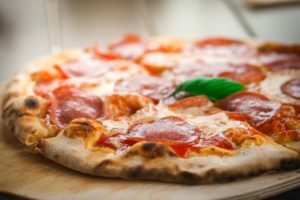 Gigio’s specializes in New York-style, thin-crust pizza, and the menu offers burgers, hot dogs, Italian beef and sausages, tacos and burritos, salads, homemade soups, and more. Your participation in this fundraiser supports our work toward a future where individuals with disabilities have access to all opportunities of a full life.